There are things that are not visible to the naked eye like tiny particles and organisms that require special apparatus to be seen. But there are also details that aren’t exactly tiny but are oftentimes overlooked because to others, they are unnecessary. In graphic design, attention to detail is very important. To be a good graphic designer, you must start by training your senses to recognize different design details that only we designers are trained to see. Graphic designers see beyond the 16-pc crayon set. In fact, we can identify more than 16 shades of pink crayons. Sometimes, we even memorize the hex codes of basic colors! Challenge your eyes and take the online color test where you’ll have to arrange color blocks by hue order. Proper kerning is needed to give our letters equal room to breathe. To most, the first two words look the same, but when we look at the third word, we can see the difference between the first two. The image above was taken from an online kerning game that lets us practice our kerning skills by moving the middle letters of words to achieve proper spacing. Above is a sample of the proper shading with a given light source. This is commonly taken for granted because people assume that all shadows are the same but they’re not. When we analyze the light source, that’s the only time we can apply a shadow to our work properly. 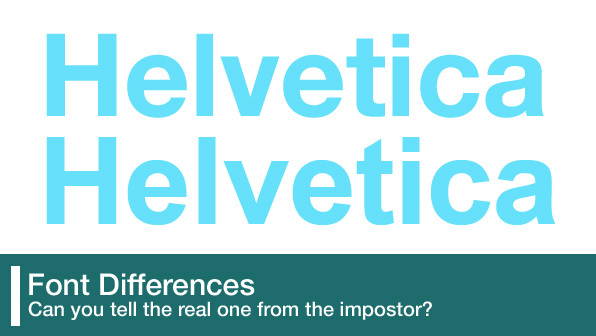 A real graphic designer or typographer should be able to tell one from the other. There are many font face dupes for paid fonts making it hard for us to distinguish the original and the copy. Above we can see the all-time favorite font Helvetica and its free copy, Arial. All the cuts of Helvetica are straight while the Arial’s are slanted. Notice the E and T of the second word. Doesn’t it frustrate you when you work on a sharp image and it appears blurry after compression? Don’t let this happen to you. Always save your files in the proper format, size and resolution. Nope, this isn’t similar to the definition loss during image compression. Jaggies are “stairlike lines that appear where there should be smooth straight lines or curves” according to Wikipedia. Sharpen your bit-mapped graphics and check if your display monitor has the right resolution for your graphic needs. A few centimeters to the left, a little move to the right. It’s hard to get alignment right without the right tools. Elements don’t always have to be centered, but using guides and smart guides to balance your work always helps. Don’t forget that graphic designers are human too and we are just as likely to commit these mistakes. It’s always easier to point out what’s wrong in other people’s work.